Pulse chickpeas in food processor or high-powered blender, until crumbled. Add remaining ingredients, minus last one on each list, and pulse until mixture is mostly smooth and gathers into a ball of dough. Transfer to mixing bowl and stir in remaining ingredient. 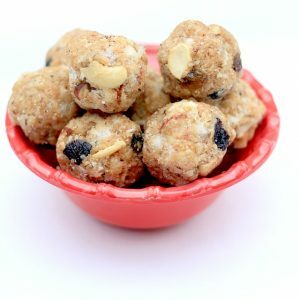 Scoop out mixture by tablespoon measure and roll into balls. Refrigerate for 30 minutes or until ready to serve. Freeze in sealed container for up to 3 months.